All the strongest movements occur only during the news, but it also happens that the news on one currency pair influences other currencies, though no news was released for them. For this Expert Advisor I do not use news lists or indicators (which are late anyway). The EA operation is concise, simple and very profitable. Expert Pending Orders places two pending orders - BUYSTOP and SELLSTOP - at a predetermined distance from the current price. The EA places the orders specified number of seconds before the candlestick closure (parameter TimeStart) and when after the specified number of seconds since the opening of a new candlestick it removes the orders that did not trigger (parameter TimeEnd). 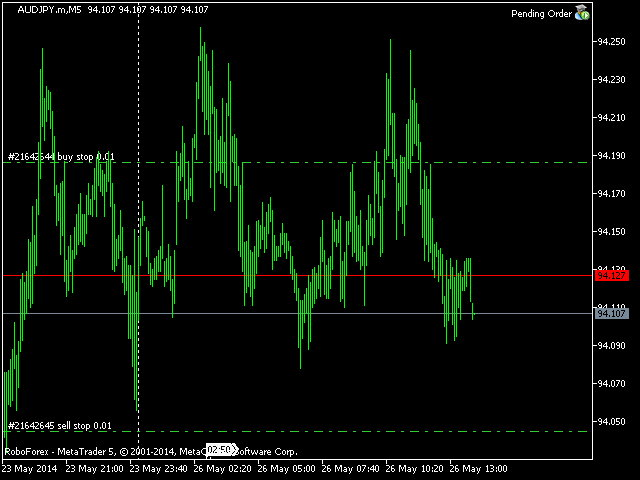 Works on any currency pairs and periods. Pending orders are placed with a predetermined Stop Loss and Take Profit (a zero value means that the option is turned off). A time filter for running around the clock or during trading sessions (HourStart - an hour when the EA will start to place orders, and HourEnd - hour when the EA stops). Better set the EA on the M5 or M15 charts of several currency pairs (optimize parameters for each pair for the last two weeks) and it will close by TakeProfit. But never forget that all existing robots are designed only for semi-automatic operation to help traders. Profit=20.0; percent of balance total profit. StopLoss=30; if 0 - disabled. TakeProfit=60; if 0 - disabled. DeltaPips=110; distance from the current price to place a pending order >0. TimeStart=10; seconds till candlestick closure. TimeEnd=20; seconds after the opening of a new candlestick, the EA will delete all orders that have not triggered. LossControl=false; move StopLoss (if return of a position is nonnegative) at the earliest opportunity, if false – disabled. 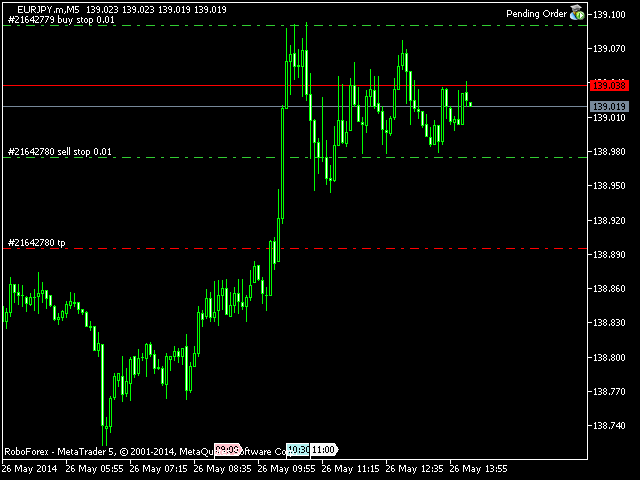 BUStart=200; profit in points to move StopLoss. sizeBU=30; breakeven level in points. TrailingStart=100; profit amount to start TrailingStop (in points). TrailingDist=100; distance of TrailingStop from the current price (in points). TrailingStep=20; TrailingStop step (in points). Magic=10000; identifier of the EA's orders and positions. HourStart=0; hour when the EA starts to place orders. HourEnd=24; hour when the EA stops placing orders. Commentary=false; comments on the Experts tab.